^ 周廣國. 《日本海軍戰神：山本五十六》. 咖啡田. 2004: 第21頁. ISBN 9867524497. ^ 周廣國. 《日本海軍戰神：山本五十六》. 咖啡田. 2004: 第52頁、第62頁. ISBN 9867524497. ^ 周廣國. 《日本海軍戰神：山本五十六》. 咖啡田. 2004: 第65頁. ISBN 9867524497. ^ 周廣國. 《日本海軍戰神：山本五十六》. 咖啡田. 2004: 第70頁. ISBN 9867524497. ^ 5.0 5.1 周廣國. 《日本海軍戰神：山本五十六》. 咖啡田. 2004: 第77頁. ISBN 9867524497. ^ 周廣國. 《日本海軍戰神：山本五十六》. 咖啡田. 2004: 第97頁. ISBN 9867524497. ^ 30.0 30.1 Willmott, H.P. Barrier and the Javelin. Annapolis: United States Naval Institute Pres, 1983. ^ 31.0 31.1 Blair, Clay, Jr. Silent Victory. (Philadelphia: Lippincott, 1975). ^ H-Net Review: Charles C. Kolb <CKolb@neh.gov> on The Pearl Harbor Papers: Inside the Japanese Plans. [2009-07-26]. （原始内容存档于2007-06-27）. 阿川弘之. 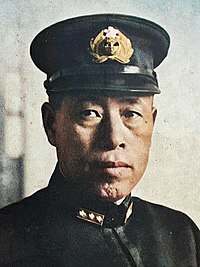 聯合艦隊司令長官：山本五十六. 麥田出版社. ISBN 957-708-154-1. 接培柱. 战争赌徒：山本五十六. 北京: 世界知识出版社. ISBN 7-501-22386-6. Hoyt, Edwin P. Yamamoto: The Man Who Planned Pearl Harbor. New York: McGraw-Hill, 1990. ISBN 978-1-58574-428-2.